The new NexusLink 3112u Bonded VDSL2 Gateway features 400mW high-power wireless for optimal reach and performance. Comtrend, a leading designer and manufacturer of broadband communication equipment, announced today its latest VDSL2 bonding gateway, the NexusLink 3112u. The NexusLink 3112u is a comprehensive, all-in-one gateway for high-bandwidth applications. Featuring Comtrend’s new 400mW high-power Wireless N technology, it can deliver high-speed performance and extended coverage for residential and commercial applications. 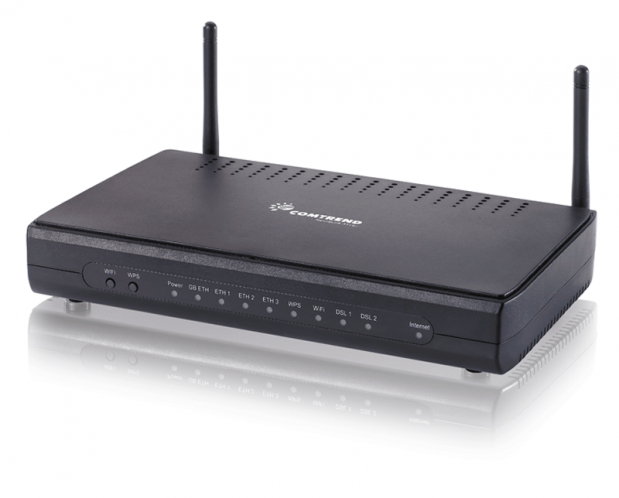 Wireless speeds can reach up to 300Mbps, and it is equipped with three Fast Ethernet ports and one Gigabit Flexport. With PTM mode support, it can provide better performance than a standard ATM-mode-only gateway. The NexusLink 3112u also features the latest technologies in bonding (up to 17a profile) and vectoring. Comtrend Vice President of Technology, Kuma Lin, explains, “Bonding provides twice the downstream/upstream bandwidth over comparable single-line models. We’ve added vectoring which reduces crosstalk levels resulting in improved performance. Customers want more bandwidth for their smart phones, tablets, and video streaming devices. The NexusLink 3112u delivers what the market demands.” Additionally, the NexusLink 3112u features QoS, VPN pass-through, and TR-069 remote management support. The NexusLink 3112u carries additional value in its ease of working in a variety of different deployments (xDSL, Fiber, Ethernet). It supports ADSL2+ fallback and has a dedicated Gigabit Flexport. This ensures great broadband opportunities at any location. Whether via DSL over copper, or the gigabit WAN port via fiber or cable, the NexusLink 3112u can be the primary gateway for any service provider deployment type. The NexusLink 3112u is now GA and samples are currently available. For pricing and to order samples please speak to your sales representative or email NA.Sales(at)comtrend(dot)com. Comtrend has a comprehensive lineup of VDSL2 gateways. Please visit for more information.